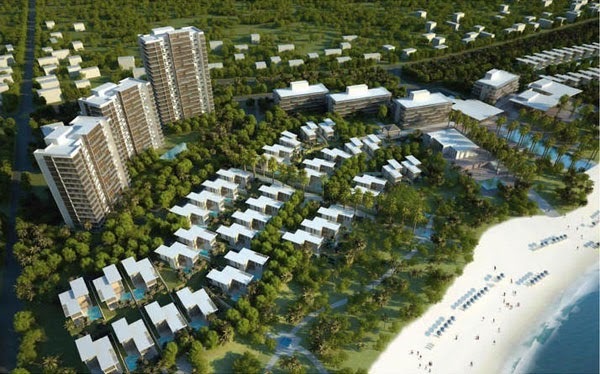 REIC - The project is envisioned as a distinctive contemporary five-star beach resort with a theme based on sustainable boutique living within a native waterfront ecosystem. This remarkable beachfront site will be transformed into a world-class resort destination with all the features, luxuries and sublime experiences of a true landmark boutique resort. The project will be unique, distinctive and offer a rarefied and sublime synergy of sea, sand, nature, and local culture. The hotel is designed as a series of pavilions carefully arranged in a stunning natural landscape. A broad curving parkway brings the visitor to a grand central entrance lobby which enjoys stunning views over the Sea along infinity pool cascading down to the beach. Facilities surround the central pool creating a center of activity and community. Linked by a series of external covered walkways, the hotel towers contain 230 well-appointed rooms and are arranged in a broad staggered arc which frames the central entry pavilion. Parking is discreetly tucked beneath the hotel maximizing landscape opportunities. - Product scope: 100 beach villas, 55 garden villas, 268 apartments, 5 star hotel includes 156 rooms & 44 bungalows. - Total investment: US$300 million.